At last, the final game of our Great Southeast Hockey and Letterboxing Tour has arrived. 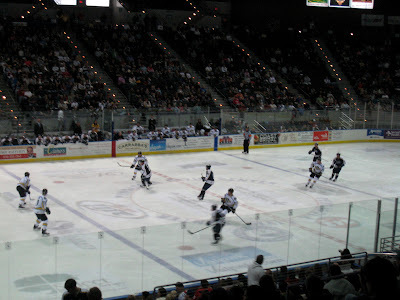 The Pensacola Ice Flyers faced off against Georgia's Columbus Cottonmouths in the Pensacola arena. With Pensacola tied for second place and eager to claw their way to the top of the league standings, it promised to be an intense match. The teams did not disappoint. Despite the Columbus team's significantly weaker record, the Cottonmouths made the game competitive. Both teams played well and either could have won. Unfortunately for the visitors, Pensacola scored the winning goal after an error by a Columbus player. Pensacola's 4-3 win elevated them to first place in the league standings.